San Antonio Home Cleaning Done Right. Every Time. 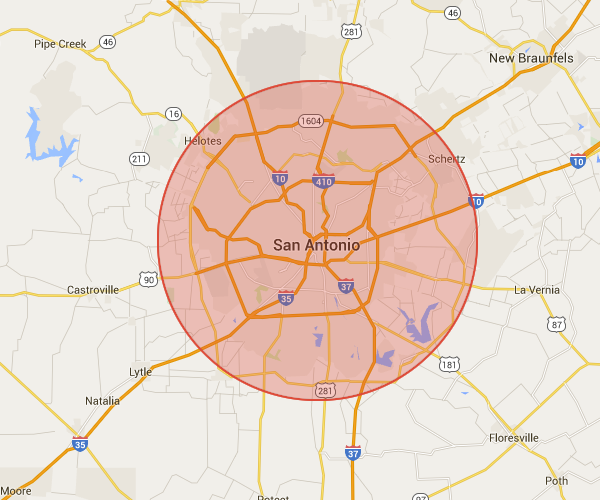 We service all of San Antonio and its suburbs. If you aren't sure if we'll service your area please give us a call. Do you enjoy cleaning your home? Is your schedule free and clear to spend time scrubbing the floors and wiping down your countertops? Probably not. Many people throughout the San Antonio area have busy schedules and it can be difficult to simply drop everything to clean your home thoroughly. If you have ever experienced a surprise visit by someone in your family or a close friend, you know how embarrassing it can be when you don't invite them in or when they have to swim through dirty laundry and piles of toys just to get to the couch. Before you have another panic attack when the doorbell rings, give the team at Maid Complete a call today. We are your local San Antonio residential house cleaners and will keep your home clean and smelling fresh from top to bottom. If you work a typical nine to five, it is not easy to find time to clean once you get home. Not only that, who really wants to clean after a long day filled with customers and standing on your feet! In addition, if you have the weekends off, you probably want to spend time hanging out with the kids, heading to the mall, or simply going out to eat at a nice restaurant, right? With Maid Complete on your side, you can spend time doing the things that you love all while coming home to a clean house. You can take the kids to soccer practice, enjoy a romantic walk through the city, and even sit down and catch a movie that is airing on TV! Living in San Antonio means that you experience a hot and sometimes humid climate depending on what time of year it is. It is essential that you keep your home clean for a number of different reasons, with the two most important being pests and mold. The hot climate pushes pests into your home, especially when the temperatures climb. Pests, such as scorpions and other native insects will seek refuge in your home because it is cooler and there is water available. A regular house cleaning can prevent these pests from hiding in unkempt places, piles of papers, or near garbage receptacles. In addition, with a thorough house cleaning, we will be able to spot any problem areas and alert you to them right away. Think about it for a moment. It is easy to make a sandwich in the kitchen and spill a bit of jelly on the counter. Since you are busy, you probably just brush it aside and say, â€œI'll clean it up later.â€� Sometimes later never happens and then before you know it, there is an army of sugar ants marching on your countertops. Maid Complete will put an end to those small jelly spills and keep your home clean from the ceiling to the floor. If you are not able to keep up with cleaning your bathroom or other areas of your home where water collects, you may experience a mold problem. Mold can make you and your family sick and it spreads quickly once it starts to grow. Since San Antonio can get humid throughout the summer months, it is essential that you thoroughly clean your laundry room, kitchen, and bathroom to prevent mold. Don't have the time to put in the elbow grease? Maid Complete does! Give us a call today to schedule your consultation. If you are still tossing around the idea of having house cleaners come in and clean your home, there are some benefits you need to consider. When you hire maids, you are better able to manage your time AND save time. You will be able to do more throughout the day and not have to worry about cleaning when everything is said and done. A dirty home harbors all kinds of dust, dirt, and allergens. When you breathe in these things, it can make you sick. In addition, if you have carpet throughout your home, your carpet is holding on to these allergens. Maid Complete is dedicated to providing you with quality residential house cleaning services throughout the San Antonio area. All of our maids are insured and ready to clean your home for you. When we come out to your home, we will always bring our own products and complete a thorough cleaning of your home in the most efficient manner. We love our customers and want nothing more than for you to be completely satisfied with the job we complete. When it comes to your home, you know what needs to be cleaned and we are ready to listen. Our house cleaners will sit down with you to find out which areas of your home you want us to focus on the most. Want us to avoid an area of your home? Not a problem. We will only clean and enter the areas that YOU say are okay. Each of our maids is able to perform all types of cleaning duties from light tasks to deep cleaning. Looking for a specific service or need a specialized cleaning performed? Just ask us! Maid Complete is ready to clean your home and keep it smelling fresh. Give us a call today to schedule your consultation for service! By far the best service I've had! House cleaning done right. Easy to book online and showed up on time and did a great job cleaning. After trying a couple of local franchises I called Maid Complete and they've been perfect for us.